Joel Kauffman was “lonesome” at Lonesome Pine Speedway on Saturday night. He may have had his family, a new team and his new crew chief there, but he was in a class by himself on the race track. And for Kauffman and this team, the win couldn't come at a better time. Kauffman's Pro Cup career hasn't gone as planned for the Indiana-native. He came into the Pro Cup world with very high expectations. 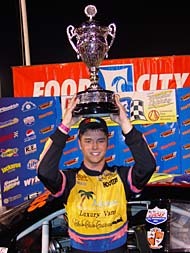 Kauffman had a lot of hype after becoming the youngest CRA/SSS Super Late Model Champion in the history of that series at the tender age of 16. But since, that hype has lost some of it's luster. Kauffman had the dominant car all night at stop number two for the Hooters Pro Cup Series Northern Division in Coeburn, VA. He capitalized on his rocket ship-racecar and made it look pretty easy en route to the win over second- and third-place finishers Benny Gordon and AJ Frank. Kauffman had the dominant car in the season opener at South Boston Speedway a couple of weeks ago too, but at Lonesome Pine, he was able to make it last. Kauffman, now 19-years old, hasn't had the best of times in his two full seasons in the Pro Cup Series. 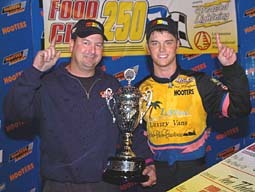 But he rekindled that magic last season grabbing his first career Pro Cup win at Salem Speedway in Indiana. Yet, 2004 was a year where expectations were not met. With two years of experience under his belt and a win just two races into 2005, the teenager is now the man to beat in the Northern Division. Kauffman's #44 was fast all day at Pine. The win was very special for Kauffman and his family-owned team. And he showed that emotion in a lengthy and teary-eyed embrace with his father and mother in victory lane. Vern Kauffman has always been behind his son’s efforts, and appreciated the importance of the moment too. One of those big changes was new crew chief Barry Elvis. Elvis joined the team over the winter and has not only been working at the shop, but also lives with his driver. 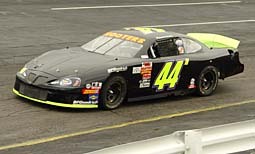 With a pole and a sixth at South Boston Speedway (VA) and a win at Lonesome Pine, the #44 Team now sits second in points. With a new outlook, a new crew chief and roommate, Joel Kauffman is now living up to those expectations in the Pro Cup world. Editor's Note: Speed51.com will have more on the Pro Cup Northern Division race at Lonesome Pine coming soon in our Leftovers section. The living arrangement is unusual, but it works. The duo has gelled quicker than even they had expected. “I couldn't write a better story for our team being new,” says Joel. “It's virtually all new people. We went from having four or five guys, full-time in the shop to having two. You would think that is harder but these cars are so easier to drive right now. We've got so much knowledge and awesome pit crew. You couldn't really ask for much more. We had the perfect package tonight and the perfect car. Crew chief Barry Elvis poses with his roomate and driver after their first win together (Kathy Bond Photo). Joel and his father Vern share an emotional moment in victory lane (51 Photo).